Hemingway was a great lover of Champagne and he often referred to it in his writing. In The Sun Also Rises, three of Hemingway’s characters - - the free-spending, Champagne-loving Count Mippipopolous, the protagonist Jake Barnes, and the unforgettable femme fatale Lady Brett - - polish off three bottles of Mumms in a single session. The Champagne drinking scene took place in the opening chapters just before Jake Barnes, Lady Brett, Robert Cohn, Mike Campbell, and Bill Gorton - - fictional charter members of Gertrude Stein’s “Lost Generation” - - headed down to Pamplona, Spain for the Fiestas de San Fermín, sans Count Mippipopolous. At the beginning of Fiesta, Hemingway’s characters, now minus the Count’s generous Champagne contributions, switched to cheap red wine in the peasant bars of the old quarter of Pamplona. The Sun Also Rises, published in 1926, became a classic and spawned a cult-like devotion to San Fermín, especially among English-speaking foreigners. It would be several decades before the modern-day incarnation of the Count surfaced at San Fermín in the person of a generous Welshman named Noel Chandler. Chandler, like Count Mippipopolous, has drunk his share of Champagne in Paris (where he celebrates New Year’s Eve). Although he neither holds, nor claims a title, with his rugged countenance, polished manners, and mysterious air, Chandler is clearly a worthy spiritual descendant of Hemingway’s Champagne-loving Count and his annual San Fermín Champagne party, until a few years ago when it was decided that the well-aged timbers of Chandler’s lofty walk-up apartment above the calle Estefeta could not safely support the many scores of people who were ascending each 6th of July to party with Noel. Noel Chandler. Photo by Gerry Dawes. Over the years, Chandler’s annual party had become one of the hottest invitations in Pamplona. One of the great bullfight aficionados of all time, a first-rate Hispanophile, and a veteran of more than forty sanfermines and countless encierros (the running of the bulls), which pass through the famous Estafeta below the scene of the Champagne parties, Noel Chandler had indeed become Pamplona’s Conde de Champagne. At 10:00 a.m. on the sixth of July every year for nearly fifteen years, in his apartment, you could find Chandler carefully unpacking and chilling 5-6 cases of Perrier-Jouët, Veuve Clicquot, Gossett, or Moët & Chandon Champagne. Soon the first of nearly 200 San Fermín devotees from all over the world would begin arriving at Chandler’s place to help pop the corks and celebrate the beginning of yet another Fiesta. In The Sun Also Rises, Hemingway described opening day of the Fiestas de San Fermín at Pamplona as well as anyone, "At noon of Sunday, the 6th of July, the Fiesta exploded. There is no other way to describe it." On calle Estafeta, a legendary street where many a bullrunner, including Noel Chandler, has made his reputation, hundreds of people gather on their way to Pamplona's storybook city hall to await the firing by the city's politicos of the cohete, or rocket, which signals the beginning of this wild event. 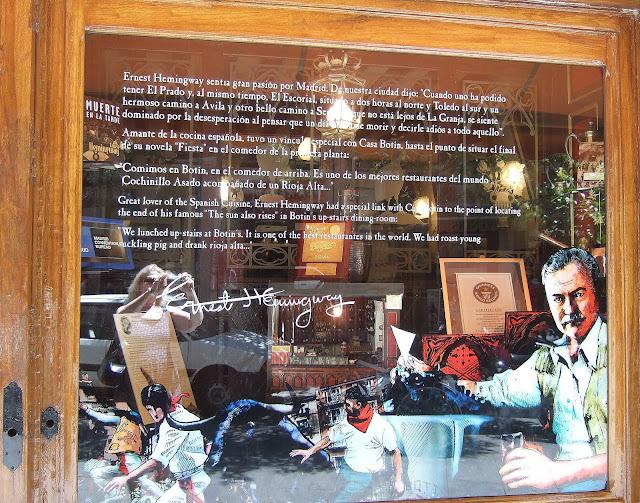 During the course of the raucous eight-and-a-half day fiesta, the brave, the loco, and the inebriated (often one and the same), young and not-so-young men (and sometimes women) allow themselves to be chased by bulls through the streets of the old town for what Don Ernesto, as Hemingway is known here, called "a morning's pleasure." But before they do, they need that first day, July 6th, to gear up for fiesta and recharge their courage batteries for the next morning’s running of the bulls by drinking everything in sight--beer, wine, hard stuff, and lots of bulk-produced sparkling wine, admittedly a poor substitute for real Champagne. 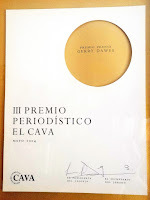 In recent years, this non-method champenoise bubbly has been the wine of choice on opening day and the San Fermín celebrants pour it on, in, and around one another in astonishing quantities. Within a few minutes after the cohete explodes above the city, the Estafeta will be a river of white-and-red clad party animals bouncing up the street to the infectious folk music of Navarra, drinking and spraying mega-hectolitres of cheap fizzy wine as they go. Beginning about 11:00 a.m., Noel Chandler’s guests used to climb the stairs of an unprepossessing building to his large, rambling apartment on the fifth floor. Here there will be no cheap sparklers. At Chandler’s place, real French Champagne is served and it will be poured into, not on, the guests. 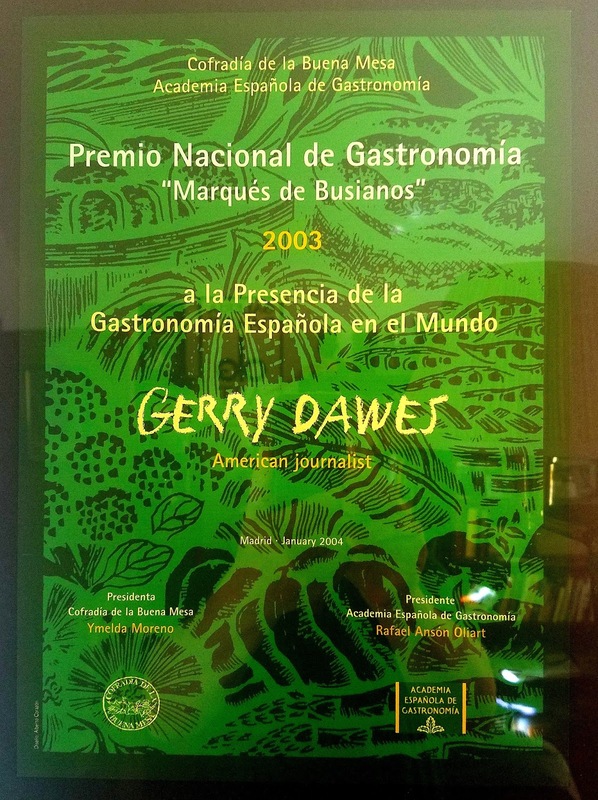 The invited (and, often self-invited)--screenwriters, artists, photographers, stockbrokers, lawyers, professors, Basque bullrunners, the occasional bullfighter, etc.--arrived from points scattered across the globe: Australia, England, France, Sweden, Israel, California, New York, Florida, and all around Spain. Many would have not seen each other since sanfermines past, so there were big abrazos all around and much catching up on the past year’s happenings. At a typical Chandler Champagne party, it common to see many of the following people: Noel Chandler’s long time companion, Nancy Fortier of Atlanta; Jim Hollander, a crack wire photographer based in Tel Aviv; Davey Crockett, a descendant of the famous American frontiersman, a veteran at San Fermín, and survivor of many encierros (bull runs); writer Jesse Graham, a relative of the great Gerald Brenan; the fine New York artist Warren Parker; and British bullfight guru Michael Wigram, all of whom would salute each other with a clink of Champagne flutes. The late Charles Patrick Scanlan, a long-time resident of Spain and one of the most knowledgeable aficionados would be in a corner working out the disposition of season bullfight tickets with Rex Howieson, the group’s semi-official social director. Jesse Graham. Photo by Gerry Dawes. 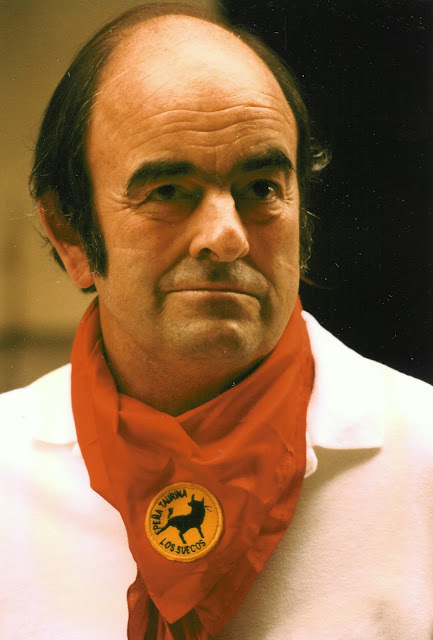 Joseph Distler, then a New York restaurateur and bar owner, who now lives in Paris and has run on the horns of the fighting bulls in every Pamplona encierro for the more than forty years and has appeared on such highly rated American television programs as 20/20 and 48 Hours stopped at the top of the stairs, then turned in the middle of greeting Noel Chandler and a circle of guests to introduce himself to a stunning Spanish woman with dazzling eyes. “¡Holahhh! Soy José,” Distler purred in his Brooklyn-accented Spanish. 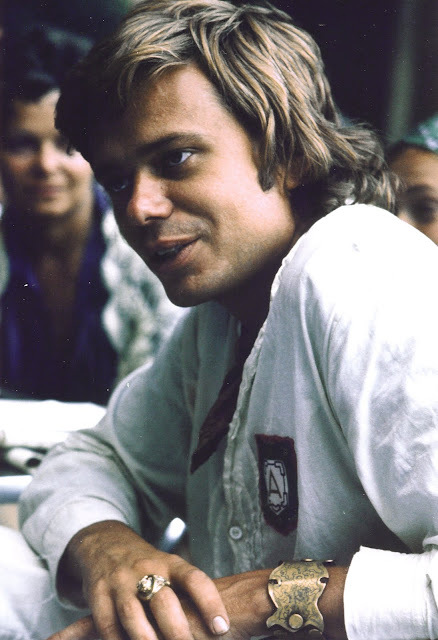 Joe Distler in the 1970s. Photo by Gerry Dawes. Guests would make their way down the long hall past some exceptional taurine photographs, pictures from Fiestas past, and the Matt Carney Memorial Suite, the room where the great bullrunner and honorary son of Pamplona used to stay, complete with Carney’s old bullrunning costume and other mementos. In Chandler’s living room, Champagne glasses were lined up on a cupboard and a television set was strategically placed so guests can watch the firing of the cohete. The whole apartment scene was like a New Year’s Eve party, except it was held in July in the middle of the day. The Champagne flowed freely as more hearty “¡Viva San Fermín!” toasts accompanied by big abrazos worked their way around the room. Guests took turns standing on either of the two small balconies overlooking calle Estafeta, where the crowd who watched the firing of the cohete from the Plaza del Ayuntamiento, begins to pour into the surrounding streets, singing, dancing, and drinking as they go. The crowd surge effect is like popping the cork on a bottle of Champagne. All day on July 6th, more people would drift in and out of Noel Chandler’s apartment, stopping to saludar the host, sip a glass of Champagne and catch up with old friends who are attending this year’s fiesta. In small groups, they recounted stories from their communal oral history, whose retelling over the years has ripened it into vintage nostalgia which is indelibly engraved into memories of this very close circle of friends. For Chandler’s of friends, Hemingway’s Sun still rises each year on San Fermín. Over a glass of Gosset Grand Reserve in Pamplona during San Fermín this year, Chandler described how his Champagne party had evolved. 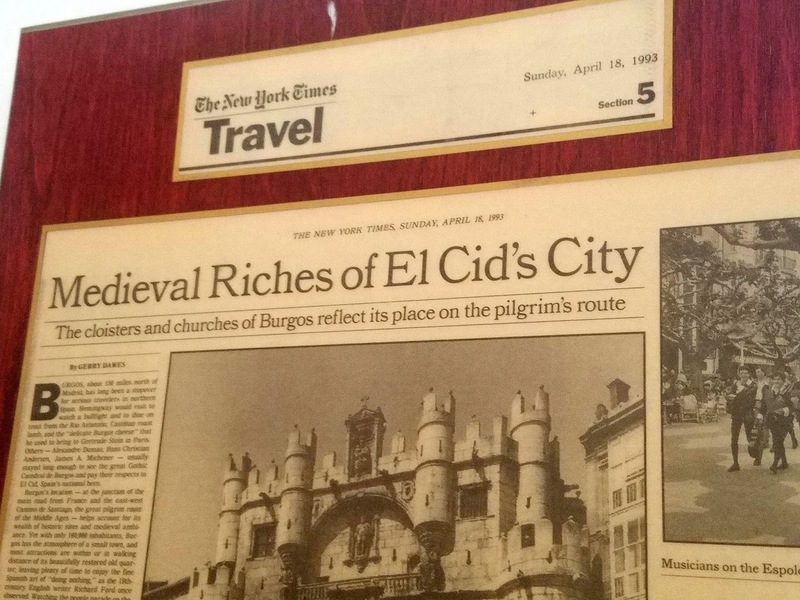 “For thirteen years through 1983, we had a fantastic Champagne breakfast at the Tres Reyes hotel. Then in 1984, after I had purchased the apartment, I decided to have my own opening day Champagne party. It started out fairly small. 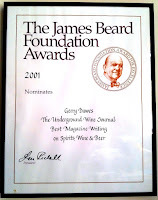 We only had about 15 people - - myself, my old Australian friend Rex Howieson, the late legendary Irish-American bullrunner Matt Carney, Joe Distler, and a few other San Fermín regulars and their ladies. But having to think about it could wait. Chandler still had eight more days of Fiesta to go. And that included a Gosset Champagne supper at Pamplona’s superb San Ignacio restaurant in honor of the matador (and Chandler’s long-time favorite) Francisco Rivera Ordoñez. 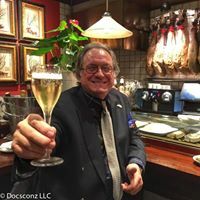 Rivera Ordoñez, grandson of the great Antonio Ordoñez, is a disciplined young torero, who is seldom seen drinking anything alcoholic during the season, but not even he passed up a glass of Gosset Champagne Gran Reserve. Chandler and the other guests agreed it was “amazing” Champagne. Later in the week, Chandler was feted by Revue du Champagne magazine’s Tom Källene at a street breakfast. These traditional breakfasts are one of the most endearing customs of San Fermín. Trestle tables are lined up outside bar-restaurants in the cobblestoned streets of the old quarter for group breakfasts featuring eggs, ham, and fried potatoes accompanied by plenty of wine, singing, and laughter. The breakfasts are often interrupted as delivery trucks try to squeeze by within inches of the guests, who in turn become good-natured traffic directors, while others applaud the progress of the truck as it crawls by the gathering. At the time I doubted that Chandler’s “having to think about it” would put an end to Noel Chandler’s traditional Champagne party at San Fermín. 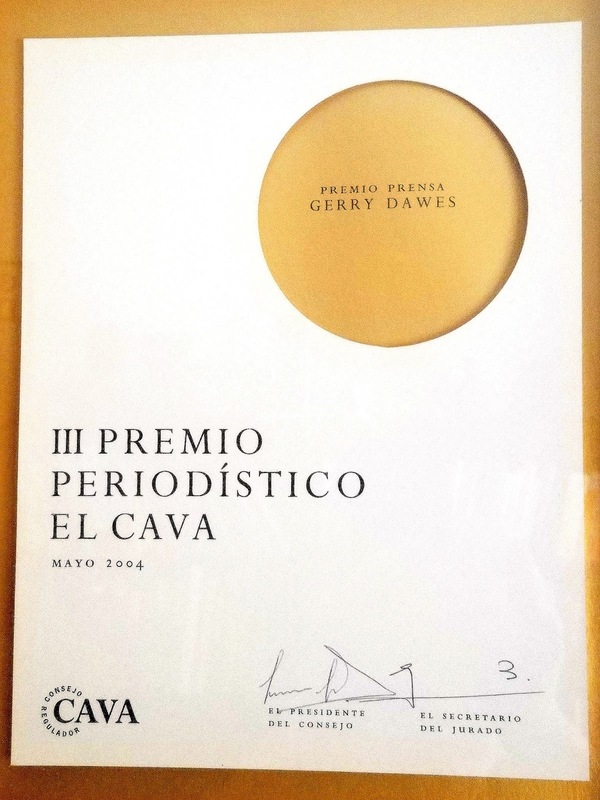 For a few years after I interviewed him, at noon on the sixth of July each year, the Fiesta still exploded, the corks will still popped, and “amazing” Champagne still flowed at the Conde de Champagne’s apartment high above the calle Estafeta in Pamplona, Spain. You could count on it, that is, a few years ago when the reality that they all might soon be celebrating the fiesta at street level after Chandler learned that there was a very real possibility that the ancient floor of his vintage apartment might no longer support a couple of hundred revelers full of Champagne. That year, he ostensibly called a halt to The Champagne Count of San Fermín's remarkable, effervescent fiesta. 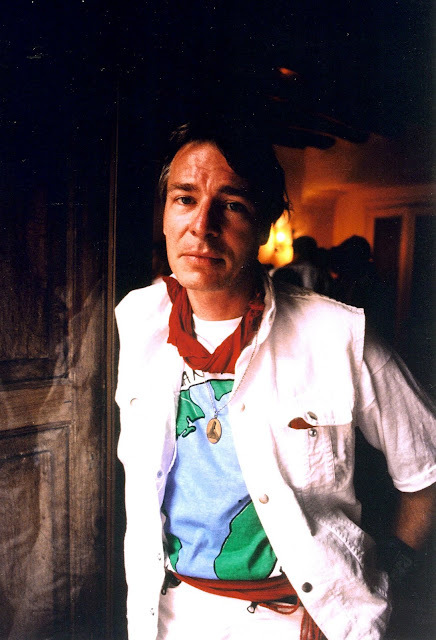 Note: On October 14, my old friend Noel Chandler, passed from our midst and went on to his Estefeta piso en the sky. 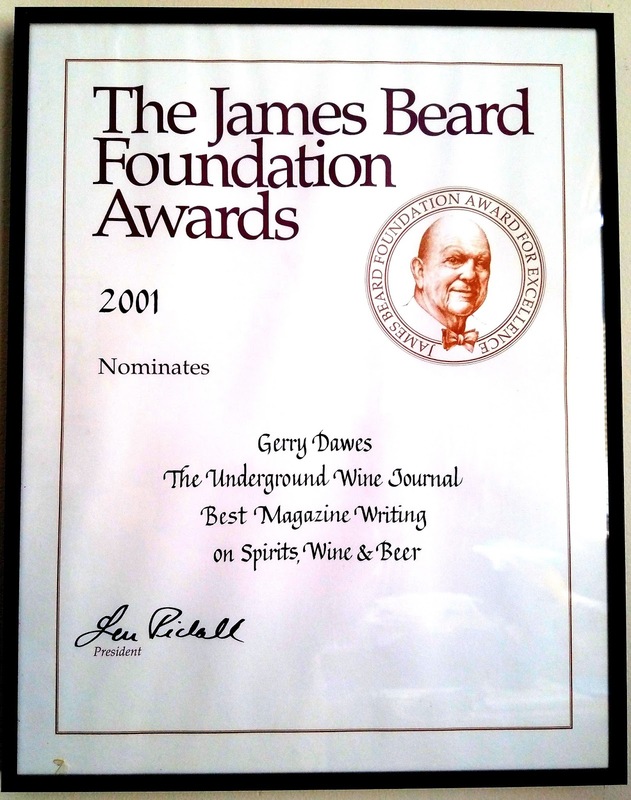 He was truly one of a kind, a legend who was a dear friend of mine for some forty years. Each of Gerry Dawes’s three daughters, Erica, Elena, and Maria had drops of Pol Roger Champagne placed on their lips within minutes of their births. 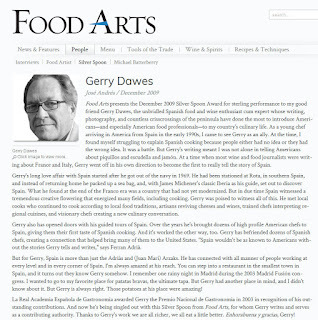 In December, 2009, Dawes was the subject of the Food Arts Silver Spoon Award in a profile written by José Andrés. You tell the story so well that I almost feel I was there myself! Great photos also! Thanks so much Ger, I really love reading your journals, wonderful stuff and love your writing style.